Here's a very late, last-minute sign-up. Sorry about that. Worked out better, my jetlag has been causing me to fall behind on getting my main post up. Fortunately I made time for it today so there's that. Faelor felt a tap on his shoulder, making him pause raising the tankard to his lips. He turned and found himself staring at an older man cloaked in what appeared to be wolf skins. The elf raised an eyebrow as he looked. For a moment the two stared at each other before Faelor broke the silence. "I assume you want to join the crew?" he ventured. The wolf-man nodded. Faelor shrugged, muttering something about what harm was there in another member wanting to possibly fall of the edge. It was apparent the alcohol had taken ahold. He produced the parchment of names and notes and took down the man's name. "Welcome aboard," he said as he finished writing. Beside the man's name was a small note of 'old, but looks handy in a pinch.' He looked up at the man. "The ship is the Sun Chaser, she's hard to miss. We leave at dawn." I know some of you have posted but just for official-ness sake: The RP Has Started! If anyone else wants to join I will be leaving the sign-ups open so just feel free to PM me or post here! All will bow before... DOCTOR PISCES! 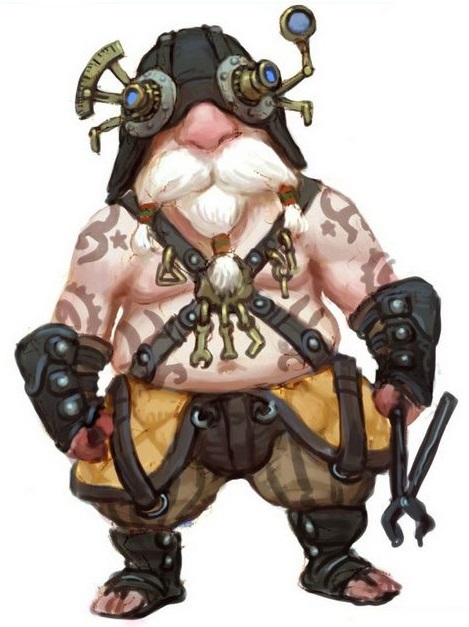 Short (even for a dwarf) and somewhat flabby, Sid is never without his toolbox and adjustable goggles. His white beard is kept fairly short for a dwarf and is always tied into braids, to prevent it from getting caught in the many moving parts of his myriad inventions. Weapon(s): Sid is not a fighter. Some of his tools could be pressed into use as weapons, but he finds violence distasteful and his equipment is far too highly calibrated to risk damage via bludgeoning. Trinkets: Most of Sid's equipment is kept in his workshop, and the oft-volatile nature of his work means he tries not to become too sentimentally attached to most of his possessions - one stray pinch of chemicals and he often finds himself singed, covered in soot and homeless. Despite this, Sid's tools are his lifeblood. Mostly handcrafted or improved, his tools are some of the finest examples of dwarven craftsmanship in the world. He also lugs a straw-filled cloth mannequin roughly his size he has named Snorri the Ninth. It has a large, smiling face painted on it. Nobody asks what happened to the last eight Snorris. Biography: Siduil studied the world for longer than many dwarves have been alive. Deep within the mountains, Siduil gorged himself on knowledge - books, scrolls, inscriptions were his bread and butter. A compulsive learner and savant, Siduil found most fields came easy to him - except for runic magic. While he developed a near-encyclopedic knowledge of runic theory, Siduil lacked the gift to channel magic the way his dwarven brethren could, and so he turned to science. His first attempts to recreate - or, perhaps, improve upon - runic magic were a dismal failure. Alchemy and potions could only go so far, and Siduil's gadgets and gizmos were fiddly and prone to falling apart at the slightest provocation. The runemasters were wary, however, and Siduil's people grew tired of the constant mishaps that plagued the inventor, and he was firmly 'encouraged' to pursue his 'discoveries' elsewhere. If anything, exposure the surface world inspired Siduil, and he threw himself into his craft with gusto. He observed burrowing moles with delight, and sought to reproduce their way of tunneling. Soaring eagles inspired him to try to take to the skies (his subsequent misadventures with canvas sheets forming makeshift wings have cowed him somewhat, but he believes the principle to be sound). It was when his journey took him to the seaside, however, that his imagination was stoked once more. Time spent on a ship sailing the Boreal Sea exposed him to the aquatic creatures of the north - the furred seals and horned narwhals of the ocean captivated him. He ventured south (to warmer climates) and began to tinker again. The ocean would be his next great folly. Welcome aboard! I shall message you how I will work you in later tonight.